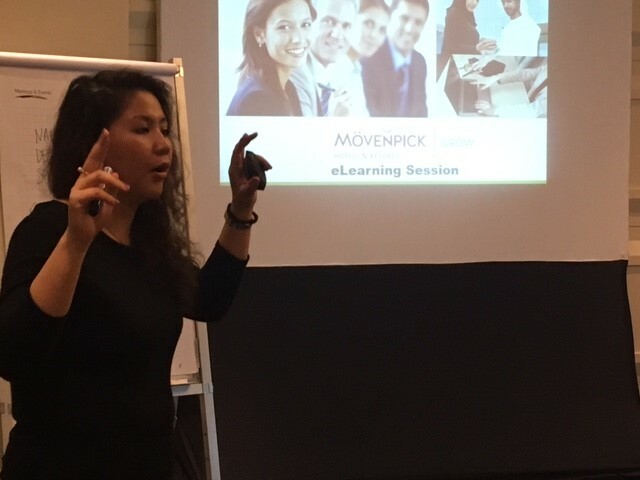 Mövenpick Hotels and Resorts launched a global Learning and Development initiative fittingly named “GROW”, in the effort to provide their colleagues a unified website where they can access eLearning content that are beneficial for their growth as professionals. XpertLearning supported this launch and conducted open sessions and webinars to introduce this program across the hotels worldwide. Last month, I was fortunate as to have been welcomed by the great Mövenpick hospitality at the Mövenpick Hotel Mactan Island Cebu, in one of the most scenic island destinations in the Philippines, to conduct the session! Ms. Rose Carayo, the hotel’s Learning and Development Manager and a team of supervisors and department managers joined us for a fun and informative session to discuss the benefits of eLearning to professionals in the hospitality industry. They were encouraged to explore training outside of the normal classroom sessions by accessing Skillsoft eLearning courseware. According to an industry research conducted across 36,000 end users of Skillsoft eLearning programs, 8 out of 10 learners have applied what they have learned in 6 weeks. This is something that can be of great benefit, especially to Staff in Operations. The session also helped them to understand the ROIs of training— that the Skillsoft Learning Management Systems can help generate, to further support the training and development needs of their team members. In realising that the top outcomes that are influenced using eLearning programs are quality, productivity, employee satisfaction, and customer satisfaction, they could not be any more excited about it! A user demonstration for the GROW portal was also done to further assist them in this effort to familiarise themselves to the system. Many of the participants expressed their excitement in Online Learning and feel that they will greatly benefit with the flexibility and accessibility of the eLearning courses, as well as with the user-friendly interface of the portal. As managers of their departments, they are now able to track the training being undergone by their team members and help support their development in each of their roles. We, at XpertLearning, congratulate the Mövenpick team on their Online Learning journey and thank the staff for their hospitality that has been a highlight in my trip to the Queen City of the South!